In recent years, all things Latin-inspired have become wildly trendy in Paris. The Brazilian caipirinha cocktail has all but taken over the cosmo and the screwdriver in bar orders, and once-absent Mexican restaurants are beginning to sprout up across the city (although whether they're any good is entirely another matter). As part of this Latin craze, salsa, tango or merengue dancing has become an ever-increasingly popular way to spend a night out, and several Paris bars and clubs are now coveted for just that. Here are my picks for the top spots for eating, drinking and dancing, Latin-style, in the city of light. Low ceilings, dim lighting and long, convivial wooden tables at La Pachanga create the perfect atmosphere for an authentic Latin night out. You’ll most likely forget you’re in Paris at all as you sip one of the bar’s homemade cocktails, with star ingredients such as guava, pineapple or lemon juice. You can also sit down for a meal, with typical menu items including Chili con carne, Fajitas and Brazilian prawns. The real treat at La Pachanga, however, is its salsa dance classes, which are on offer every day of the week. You can also choose from a variety of passes, giving you access to the club, a cocktail and a salsa class. On Sundays, take a break from Cuban salsa and try out the Bachata and Kizomba classes. If you’re looking to dance to Latin music in a club atmosphere, we've got an ideal spot for you: Favela Chic is something of an institution in Paris among hipsters and young urban professionals and fashionistas. The pumping electronic Brazilian music has been known to push people to dance on the tables, so if you’re looking for a relaxing night out, this isn’t the place for you. The restaurant gets mixed reviews from us– it isn’t cheap and some dishes lack anything extraordinary for the rather inflated prices. But if you’re looking for a wild night out and you love Latin music, grab your caipirinha or mojito and hit the dance floor. If nothing else, check out Barrio Latina for its exceptional architecture and colorful, intricately designed interior. Much like Favela Chic, this spot offers a club-style atmosphere with Latin music on Monday and Thursday nights, and plenty of opportunities for a raucous night out. If you’re looking to actually learn salsa steps, stop by on Sundays from 2-9pm or Mondays 8-9:30 pm, where classes are on offer at an hour and a half each. Stick around after the class to practice your new moves in the club. There’s also a restaurant at Barrio Latino, but this isn’t what the bar is known for and isn’t recommended if you’re seeking a top quality meal. What could be better than dancing the tango for free, outdoors and alongside the poetic and picturesque banks of the Seine river? Though not a bar, every night of the summer and on multiple nights during the year, you’ll find tango aficionados and all lovers of Latin culture partnering up for these charming dance nights. Hundreds flock to the river quais at around 7pm to begin practicing their moves, before the real fun begins. Beginners and experts are all welcome here, and no need to come with a partner – you’ll surely find a willing one. If you’ve never been to Havana but have always fantasized about it, this bar close to Paris' chic Saint-Germain-des-Pres neighborhood on the left bank is perhaps as close as you’ll get to stepping into the Cuban capital while in Paris (particularly if you're American and have no permission to travel there!). 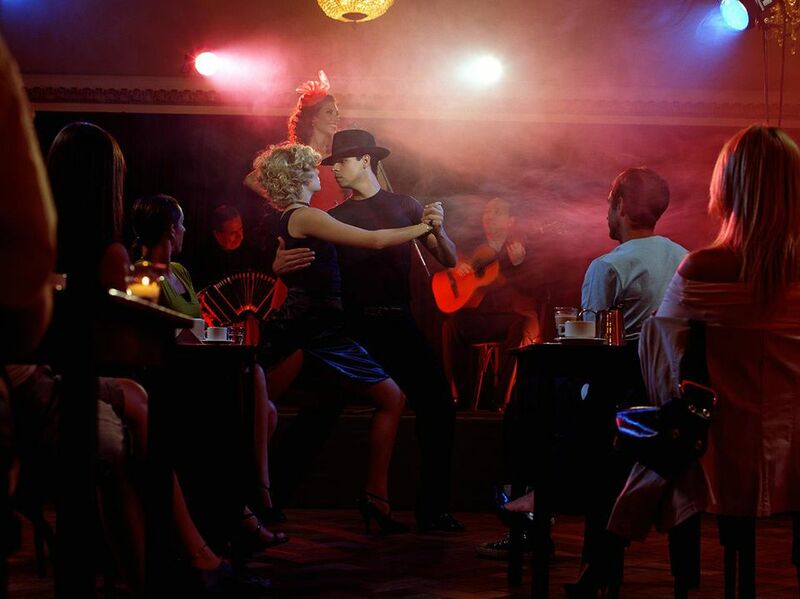 Themed nights offer salsa classes and Latin music; the cocktails and tapas are genuinely good at this bar. This means dinner followed by dancing is a distinct possibility The bar also offers a real Fumoir, complete with leather sofa chairs and palm trees to make for a close-to-authentic Cuban experience.